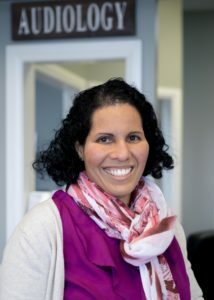 During her training at the University of Western Ontario, she completed various clinical placements to prepare her for the inherent challenges of testing and fitting hearing aids for the pediatric and adult populations. Since this time, Leiyla has worked for over 10 years in different settings to solidify and practice her audiological skills to provide excellent service and customized care with a great attention to detail towards her patients. Leiyla has worked in hospital settings fitting and fine-tuning cochlear implants as well assistive listening devices including hearing aids and FM systems. She also has experience working at private clinic settings in Calgary and the Hamilton/ Niagara region. She is prepared and well equipped to embark on the adventure of managing her own clinic and has a keen interest in helping her client on their path towards better hearing. Leiyla has two girls and enjoys spending time with her family and friends, as well as travelling to different parts of the world. Leiyla is a registered authorizer and vendor with the Assistive Devices Program (ADP) and is a registered provider with the Worker’s Safety and Insurance Board (WSIB), Veteran’s Affairs Canada (VAC) and other private insurance companies.